Vinyl Cut Decals, Stickers and Lettering use only vector based artwork to be produced. 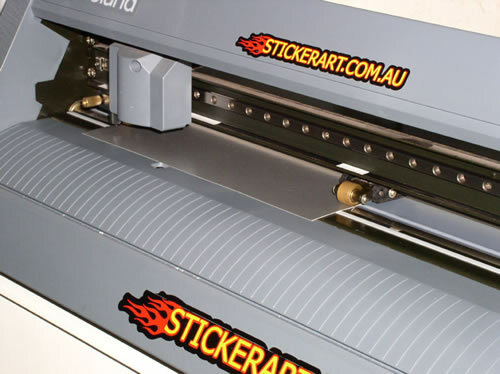 This page explains the process for making vinyl cut stickers and lettering - usually single colour stickers with no background. Depending on application, Vinyl Cut Stickers and Decals are more visually appealing and have a longer outdoor life than printed stickers. Vinyl Cut Stickers and Decals have no background giving them a professional look. We can make multiple coloured decals using separate vinyl colours. To produce Vinyl Cut Stickers, artwork needs to be in a Vector format which is very different to pictures to find on the internet or take with a digital camera. Before we can make decals and stickers, the artwork needs to be converted into a vector format. Vector images consist of lines and points, unlike most of the images that you find on the internet or take with a digital camera. Vector images can be scaled to any size without any loss or distortion to the image. This example show what a vector image looks like in a program such as Adobe Illustrator. 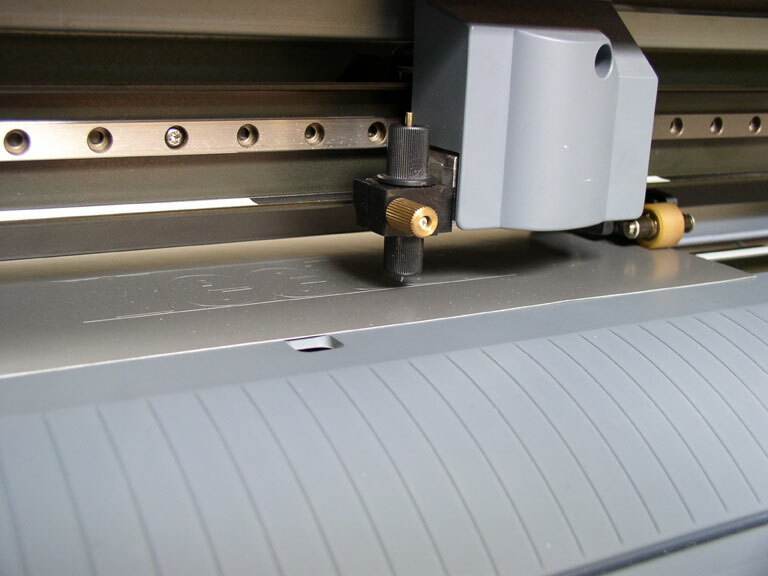 The self adhesive vinyl material is cut by by a purpose built vinyl cutting machine. The vinyl cutter has a precision blade fitted. The software tells the machine where to cut based on the lines and nodes from the artwork. After the vinyl has been cut it is 'weeded' to remove the unwanted elements of the sticker. True Type Fonts are Vector based, this is why when you use a word processor like Microsoft Word or in your email client, you can make the fonts to any size without the font distorting. If you pasted an image to Microsoft Word and made it bigger, it will start distorting. If using Microsoft Windows, you can usually find your Fonts folder by going to the Control Panel and then clicking on Fonts. If you need to send us a font, copy the font file to another location on your computer (e.g. Desktop or My Documents) and then attach it to the email you will send us. Common software used for creating and editing Vector artwork are Adobe Illustrator and CorelDraw. There are also many more. 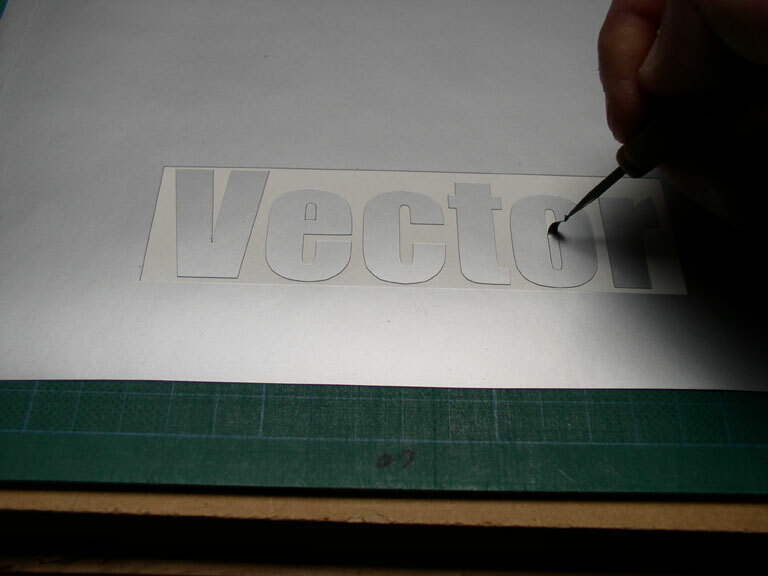 Vinyl Cutters use the lines that the Vector images are made up of, the blade on the cutter follows the lines of the Vector artwork to cut the vinyl exactly as is shown on the computer. If the lines of curves are not smooth, this will show on the decal, the bigger the decal, the more it will stand out. Converting Bitmap images (Pixel based images like .JPG, .GIF, .PNG) to Vector format can be a time consuming process, especially if it is a complex image. The image has to be traced like you would with tracing paper, except it is done on computer. Vector artwork can be using for anything from Printing, Vinyl Cutting (What we do), CNC Routing, Embroidery, Web Graphics and lots of other uses. It can also be exported to various other file formats. Make sure that all paths are closed. All Text is converted to outlines or send the font file to me with your artwork file. Optimize your image and make all paths and curves smooth with as few points as possible. If you have any questions, please do not hesitate to contact us.